This rustic vegan mashed potatoes recipe is made with olive oil, rosemary, garlic, scallions, and kale. 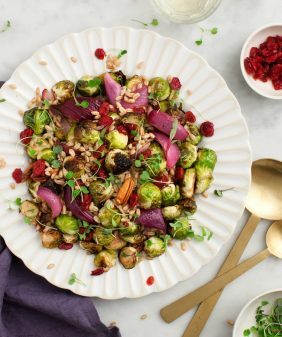 A delicious, easy vegetarian holiday side dish! Thanksgiving is next week, but I’ve been eating mashed potatoes for a while now because blogging life means eating holiday recipes early! I first made these vegan mashed potatoes for a family dinner a few weeks ago. While I was in the kitchen mashing stuff in a bowl, my brother-in-law came over and asked, “What’s in the mashed potatoes?” I said, “Potatoes…” and he said, “No, I mean, what’s the ‘potato’…is it cauliflower…is it parsnips?” He knows me so well. It dawned on me how rarely I make actual potatoes, but we’re changing that today. This Thanksgiving our potatoes are potatoes! We’re also adding a bunch of kale to them because, well… I’m still me. 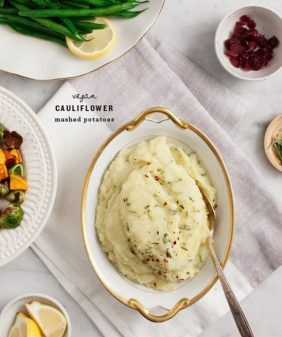 What’s special about this mashed potatoes recipe? These potatoes are not your creamy whipped cloud potato – if you’re craving that style of mash, go make this recipe. In contrast, today’s recipe is a rustic mash with garlic, scallions, and rosemary. The skins of the potatoes stay on, which makes for a wonderful texture and also ease of cooking. 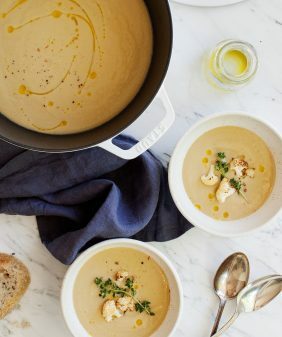 This whole recipe comes together in about 20 minutes and requires no peeling. 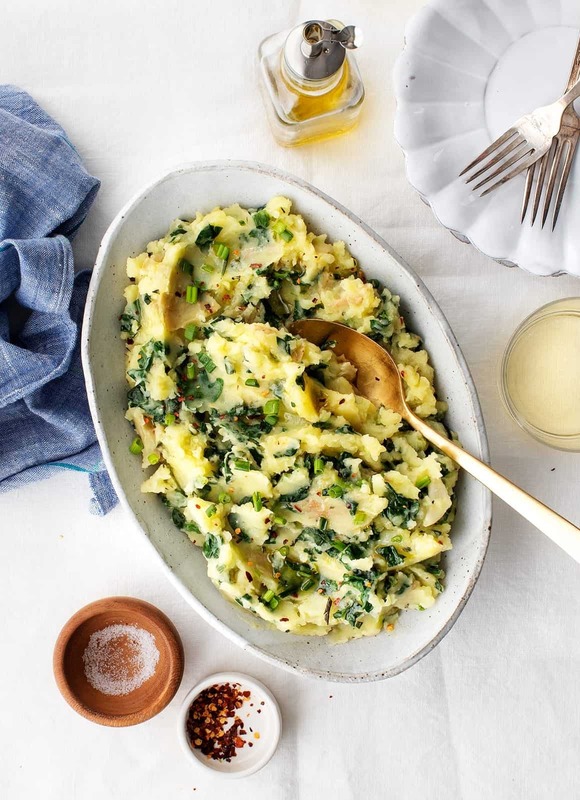 What’s more, there’s nearly a whole bunch of kale in this mashed potatoes recipe. No one will realize it, though, because it cooks down and mixes in to the potatoes so well. Kale, scallions, garlic, and….olive oil! 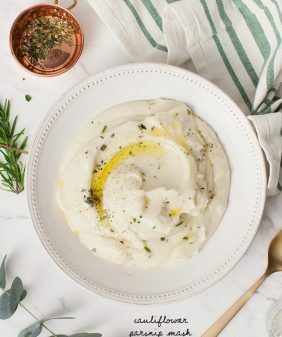 Instead of butter or sour cream, I use good amount of olive oil, which adds a delicious flavor and creamy texture to this mashed potatoes recipe. It also makes this recipe vegan without having to use any type of vegan butter substitute. I just love olive oil so much. Mmm… look at all of that kale! For more holiday recipes, check out the holiday section of our recipe index! These rustic vegan mashed potatoes are made with olive oil, rosemary, garlic, scallions, and kale. 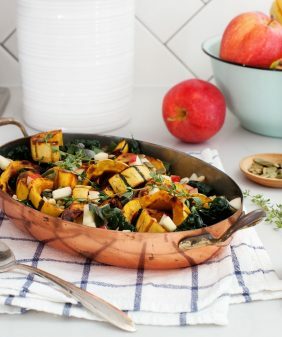 A delicious, easy vegetarian holiday side dish! 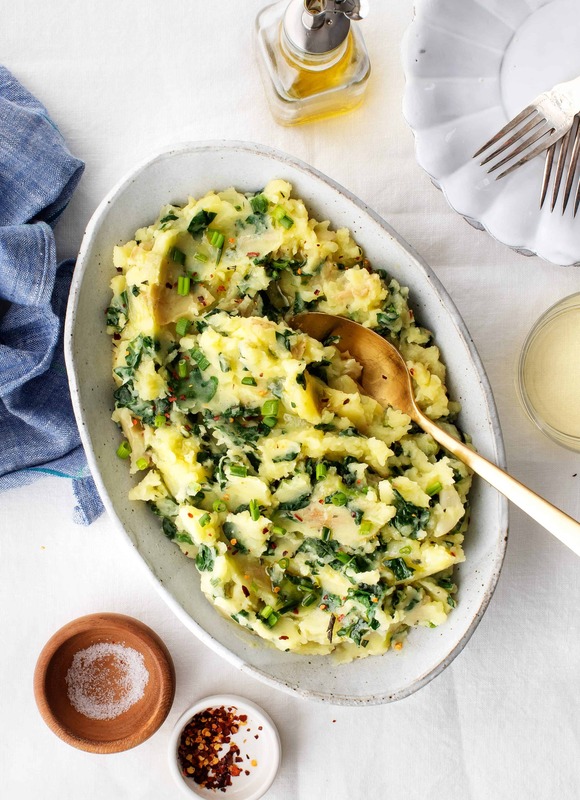 My favorite dish from Kenya is irio, which is mashed potatoes with collard greens, maize and beans (and onions, but you have scallions–same idea). It’s basically what you have here, with the addition of corn and beans, which provide a complete protein, because in much of Kenya, meat is a Sundays-only extravagance. There are a couple of special things about irio. You very finely chop the collard greens (or spinach or kale, but collard greens are revered there, they are called sukuma wiki–push the week–something to stretch resources). The fine chop, and no cooking–they wilt with the heat of the mashed potatoes, lets the chlorophyl escape and tint the potatoes a vivid green. Who doesn’t love flourescent green food! Natural! The second thing is that you’re supposed to eat with your hand. Your right hand. In Kenya and other countries in Africa, texture is just as important as flavor and smell and presentation. Folks play with their food as they converse. This recipe is a big hit with kids: bright green, and you eat with your hands. And: mashed potatoes. What’s not to love? This is an actual dish that my Dutch family makes – it’s called borecole! Which is the Dutch translation for “kale”. The dish is actually made up of hand/rough mashed potatoes and kale mixed in. Traditionally it’s served with sausage (rookworst). I made your wonderful kale and potato salad this morning. Its 25 degrees out and this is the perfect breakfast for a cold morning. I love your recipes and bought your cookbook. You had me at Lemons! I love lemons. This looks wonderful and I think I will make it for Thanksgiving. I think I will substitute cauliflower for about 1/2 of the potatos! I took this Mash recipe as my starting point and built up from it. Served with Chicken Meunière and Spicy Jalapeño Cranberry sauce. Another evening spent in great company, fine food and wine and laughter to the stars. Thank you Jeanine for being often a key inspiration on my culinary palette. That sounds like an amazing evening (spicy cranberry sauce – YUM)! I’m so happy the recipes have been an inspiration – thank you for coming back to let me know!! 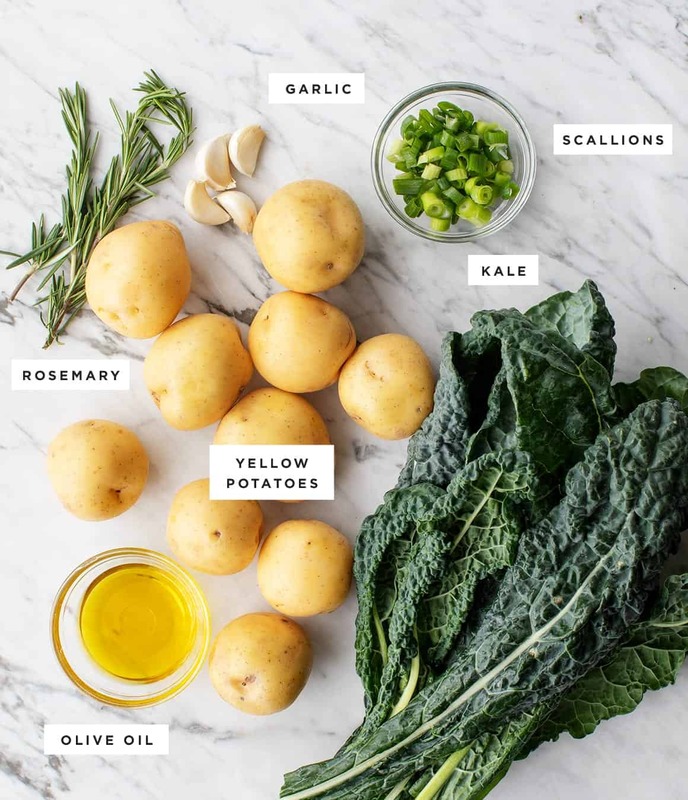 The dish look amazing and as per my knowledge Kale is good for our health and skin, even potatoes has large amount of vitamins. 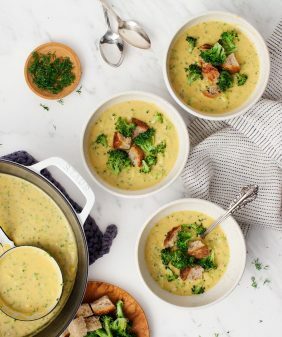 So I feel this is very health dish and I would really like to try this recipe. I love eating boiled potatoes with different flavors. I tried this recipe and really love it as has good amount of nutritional value. You may also try healthy falafel recipe as it tastes amazing.